Map showing the states, capitals and major cities of the United States. A click on the name of the State will open a page with information about the state and a general map of this state; click on a Capital's name to get a searchable map/satellite view and information about the city. 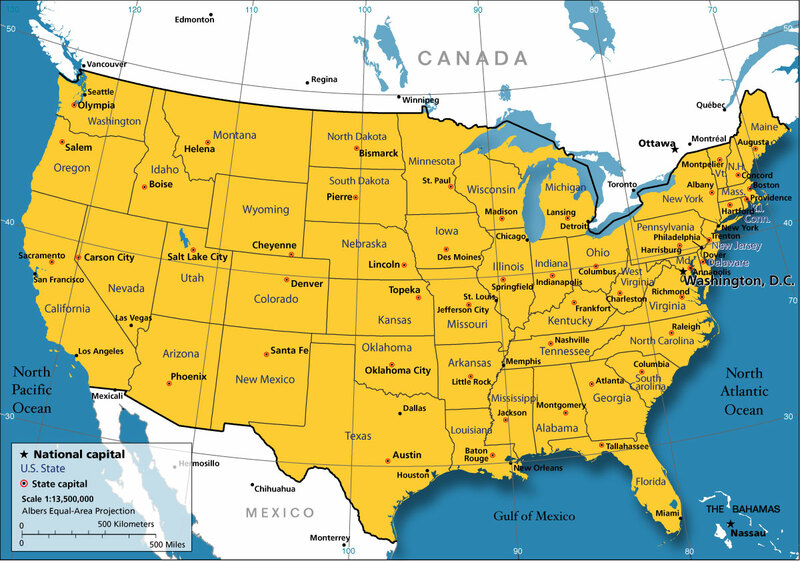 Map of the USA mainland with states borders and capital cities. Detailed Maps of the 50 States. Map is showing the 6 time zones within the United States and the actual time of the different zones. US country profile, plus links to official web sites, addresses of U.S. and foreign embassies, airlines, tourist attractions, statistics and news from American newspapers. The 50 States with city- and country guides for all states with extensive travel and tourism information. List of the 50 US States by total area size. List of the 50 US States ordered by population. Lists of U.S. cities with the most residents.